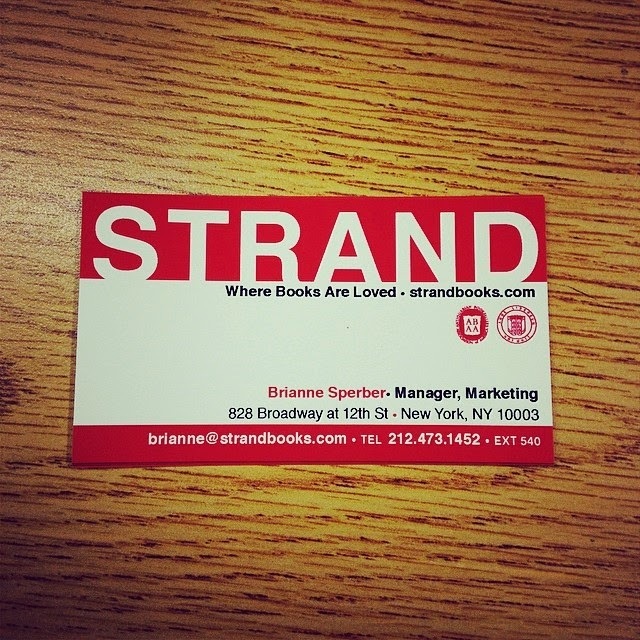 Can you tell us about your job as Marketing Manager at the Strand Book Store? I began my career in publishing, first as a literary agent’s assistant at Curtis Brown, LTD. and then took a position at Simon & Schuster, as marketing coordinator in the Adult Trade Group. My role at Strand allows me to connect with readers and booksellers—the people I feel most alike. As Marketing Manager, I manage the store’s direct-to-consumer marketing, which includes weekly email updates and social media feeds, but I also field all press requests, including interviews, promote all of our events to bloggers and the press, and I am actively seeking new partnership opportunities. We have a strong partnership with Club Monaco and Strand has a pop-up shop in the Club Monaco on Fifth Avenue and 21st Street. I’m determined to find a partnership with an equally as recognizable and powerful brand. That all said—no two days are the same. Just recently, I arranged an interview Norwegian journalist who was writing a piece on America’s independent bookstore culture and a few days after that, I gave a tour to a group of 35 Japanese CEOs looking to learn more about American businesses. I never really know what’s going to land on my desk and the constant flux of projects keeps me engaged and excited to come to work every day. You were active on the Program Board as a student at NYU. How did your experience being on PB prepare you for this position at the Strand? Do you find that social media has been an effective way to market the Strand and its events to the public? Totally. Social media allows us to communicate in real time with our customers outside of the store. This winter, we launched a tote design contest and took submissions from all over. Our grand prize winner was a UK based designer and one of the runner-ups lives in Brooklyn. Social media enables a global conversation and helps us connect with our customers who don’t get to come in every day. Social Media can usually help us prepare better for an event, too. If it seems like a lot of people are discussing it on various platforms, we can usually assume we’ll see a spike in volume. If the conversation is quiet, we will just tweet at people (influencers like bloggers or people in a particular field) to push out the event. I definitely think it’s been an effective tool for getting news out about any of our initiatives. I am committed to making our customers feel as though they’re a part of our store and as a result, many of my social media initiatives are designed to invite responses from our followers. For National Poetry Month in April, we invited our followers to share photos of “Spine Poetry,” which are poems created by stacking books on top of each other and using the titles as the poem’s lines. We had a lot of great submissions and I took as much time as I could to respond to them. In May, we’re inviting people to take “shelfies,” which are photos of a personal bookshelf. We’re already getting great responses and it’s a lot of fun to see what our followers have on their bookshelves! Are there any recent events that you were really excited about and want to share with our readers? For those who may be overwhelmed walking into the Strand, do you have a favorite section of the store and one you would recommend everyone visit? I am a big fiction reader so I spend a lot of time on our first floor, browsing the new arrivals tables to see what’s come in. That said, the Rare Book Room on our third floor is truly magnificent. It’s filled with some of the most beautiful books I’ve ever seen—gorgeous leather-bound collections and sets, first edition copies of modern classics, and some really rare editions, like a copy of James Joyces’ Ulysses that was illustrated by Matisse. I’ve heard customers refer to the room as “the secret room,” but it’s completely open to the public and accessible by the elevator. It does, however, close at 6:15 each day while the rest of the store remains open much later. No visit to the Strand is complete without a trip upstairs. It’s completely magical. Are there any interesting facts about the history of the Strand that you learned while working there that most surprised you? I had no idea just how large the entire operation was! We have a warehouse off-site in Brooklyn and a staff of just about 200 people. Seeing the influx of books and the mass of customers each day, I can definitely see why. I also didn’t know that Strand got its start on Fourth Avenue, on what was then considered “Book Row,” and competed with about forty other bookstores. After losing the lease, store founder Ben Bass moved to Broadway. Of those forty some-odd bookstores, Strand is the only one still in business—and likely because the store moved to such a busy avenue. It’s still a fiercely independent family business and I think that in the age of superstores, that fact was surprising and encouraging to me. The New York Times recently published an article about using books solely for decor. "The Strand now leads a fast-expanding marketplace of books sold by the yard, and orderable by color, subject or even spine size." Is it true that the Strand has a team of people who will help design a space using books? Yes, we do, and they are amazing! Our Books by the Foot and Personal Collections team can pretty much design a library for any home. They can select books to fit a particular size space—hence “by the foot”—and can create highly customized yet totally personal libraries for people. The team also runs our rental program, which furnishes film, television sets, and even retail stores. In a way, I’m glad to see people recognize books as works of art though I definitely hope they take the time to read at least a few of the books we select for them. 8. Is there a common feeling about eReaders amongst staff members at the Strand? Are you concerned about the future of physical books? I am definitely not concerned about the future of physical books. There are a number of statistics that show hardcover sales are growing and that eBook sales are finally leveling out. What we’re seeing now is a change in which eBooks people are reading, as readers and devices are changing much more rapidly than eBooks themselves. Based on the customer flow we have at the Strand, I know reading a physical book is still very important to people—and our customer base is very diverse. For many independent booksellers, they had to find a way either to work with or against eBooks. Our owner is staunchly anti-electronic and you’ll find that our prices not only compete with other physical book retailers—but with electronic retailers. We have an on-going promotion that spotlights the books we carry that are cheaper than the electronic editions and our book carts have thousands of books for $1 or less. Congratulations to all our GSAS graduates who will be walking in the Convocation ceremony at Lincoln Center. To celebrate our incredible graduates, here are a few of the other participants in the recent GSAS Threesis Academic Challenge. Can you explain your thesis to us in three sentences? My thesis studies factor momentum trading strategies. It studies the correlation of returns between the number of periods you look back and the number of periods you hold stocks. It also studies this correlation for up to 35 factors that would affect stock returns. How did you prepare for Threesis and what advice would you give to students who are thinking of participating next year? I would say the key to prepare for Threesis is practice, practice and practice. Having audience, friends and families to listen to the speech many many times before the show would definitely help. As a matter of fact, coming from a foreign country where English is not even my native language, I didn't expect to win when I decided to participate in Threesis. My only goal was to practice my public speaking skills. But you never know. So my advice to students thinking of participating is that, definitely try, and try hard. No matter what the result is, you will always gain something from the process. If you had unlimited funding to continue your research, how would it change the world? I would certainly leverage the unlimited fund to execute my trading strategies. It wouldn't change the world, but would certainly affect the financial industry to some certain extent. In addition, it would be a very useful result to show case in the academia. Dental implants are a popular way to treat many different dental issues while providing a beautiful and functional tooth replacement. My research focused on a very specific type of dental implant, one that is narrower in diameter and made of a different material than most. When applied to the private practice I worked in, these implants worked very well and offered our patient population yet another option for specific cases of tooth loss. I started by writing a "script" for myself. After I had all of my thoughts down, I read it out loud to myself and timed it to see if I was close to three minutes. This also helped me to see what sounded awkward and where I should elaborate. After the mentoring workshop, I went back and edited my "script" according to all of the suggestions I got. I practiced to myself, friends, family, and roommates until I found the perfect formula of what I wanted to say. Then, it was all about memorizing and getting down the correct intonation. I made flashcards and practiced my speech 2-3 times every day. After that, the rest is history! I would advise future participants to really take to heart what the mentors tell you. They know this competition and can help you learn what the judges are looking for. Also, the more prepared you are for that session, the more constructive your feedback will be to the final competition. Other than that, have fun, be yourself, and enjoy the experience! My research could go on to help provide better treatment for many patients who lose their teeth or have gum disease. By learning more about these specific implants, we could figure out what aspects of the implants are positive, what don't work well, and how we could change the implant design to ultimately have great success in a variety of different patients. Learning more about implants and understanding how different designs work can help to increase treatment options for many different patients. 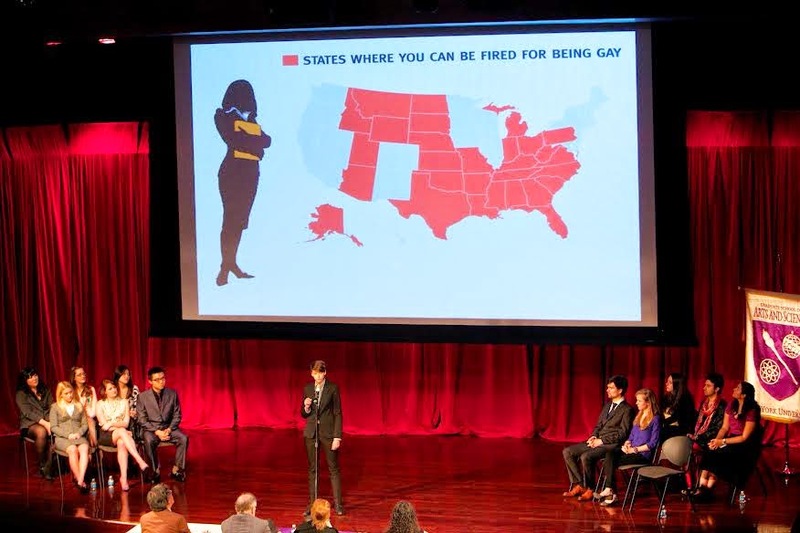 For my thesis, I collected original data to conduct the first-ever large-scale audit study that focuses on whether perceived-lesbians are discriminated against when they apply to jobs in the United States. To do this, I conducted a field experiment where a pair of fictitious women’s resumes were sent to over 800 administrative jobs via online job databases across four states, where one resume was randomly assigned experience at an LGBT student organization to signal that the woman was a lesbian, and the other, a control, was assigned experience in another progressive student organization. Results reveal that the perceived-lesbian applicants were discriminated against compared to the straight women applicants, receiving about 30% less callbacks than the straight women. To prepare for Threesis, I first wrote a script. That script ended up being way too technical, and way too long. I learned this in the workshop that all Threesis participants are required to attend, as the judges there gave me helpful feedback and constructive criticism about how to better my speech for the actual competition. After the workshop, I edited my script according to the judge's feedback, and then memorized the new script. I also practiced with friends and family, as well as in front of a mirror, to make sure I was coming across as confident and knowledgeable. I would advise students who are participating in Threesis to practice, practice, practice, and to particularly take into consideration the judges' notes from the workshop -- they are there to help you succeed in this competition. This research could help change the world as it brings into focus the discriminatory hiring practices that occur in today's workforce. 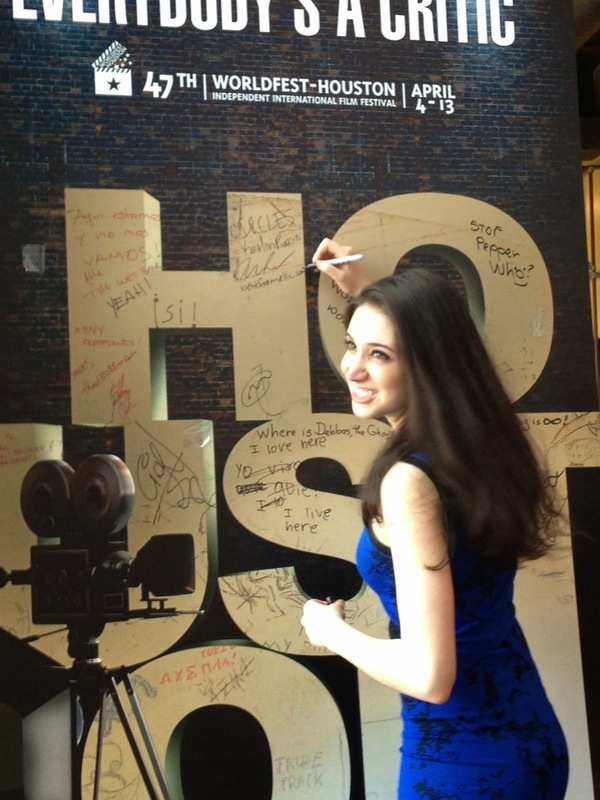 Kaitlin Puccio (LS/CAS ’10) caught the entertainment bug early in her life, but she never limited her pursuits to just one. Since she wrapped her debut short film, Circles, last October, she has been receiving awards and praise for her quadruple role as writer, director, lead actress, and producer. The film, which follows a young woman through the disorienting aftermath of a tragic loss, won awards at Golden Egg Film Festival L.A. and WorldFest-Houston, was named an Official Selection of Hoboken International Film Festival, and has been accepted to Cannes Court Métrage. Puccio took a break from the film festival circuit to explain how her Liberal Studies education, Philosophy degree, and French/Creative Writing double minor led her to the red carpet she walks today. How did your liberal arts education prepare you for work in film? I graduated high school a year early and started commuting a few days a week to New York City to study acting. After a year of training in New York, I enrolled in NYU’s Liberal Studies, where I was exposed to coursework in philosophy that really resonated with me. Ultimately I majored in Philosophy. But I would leave class with so many questions that lacked clear answers. The script for Circles was borne from this; writing it allowed me to explore deep questions about despair from a distance: through the character’s story. Though I didn’t study filmmaking in a formal context, I thought a background in philosophy would allow me to approach filmmaking from a new perspective. How did you balance the roles of writer, producer, director, and actor in this film? I knew it would be a challenge. The hardest part was compartmentalizing each role; I would have to restrain myself from carrying my role as director into a scene that I was filming as actress. But I also knew that being involved in all aspects of the film would allow them to improve on each other. What has been the most gratifying about completing your first film? I am a huge fan of learning, and this has been such a learning experience—between reading stacks of filmmaking books and watching my team work. Even the process of just attending film festivals has taught me a lot. But the small things have been gratifying, too. One evening, during pre-production, I ate a great dinner at La Sirène in SoHo. I sought out the owner to compliment him, spoke with him in French, and ended up getting his permission to film at his restaurant. Because my film was self-funded, this, along with all the filming locations that I secured for no charge, was a huge victory. What keeps you busy when you’re not promoting Circles? In 2013, I formed Bent Frame, LLC, a production and publishing company, to house all of my creative pursuits and—in the future—other people’s work. But I’ve always been, first and foremost, a writer. Right now, I am writing a feature-length script as well as researching and writing for a financial journalist. I also write gluten-free lifestyle content under a pseudonym, Celia Kaye, and I am currently filming a video series based on my short, philosophical fiction featured on Philosopagus.com, a website that I created. Right now I am a big fan of The Broken Circle Breakdown, an Oscar-nominated Belgian film that I saw at The Walter Reade Theater at Lincoln Center. 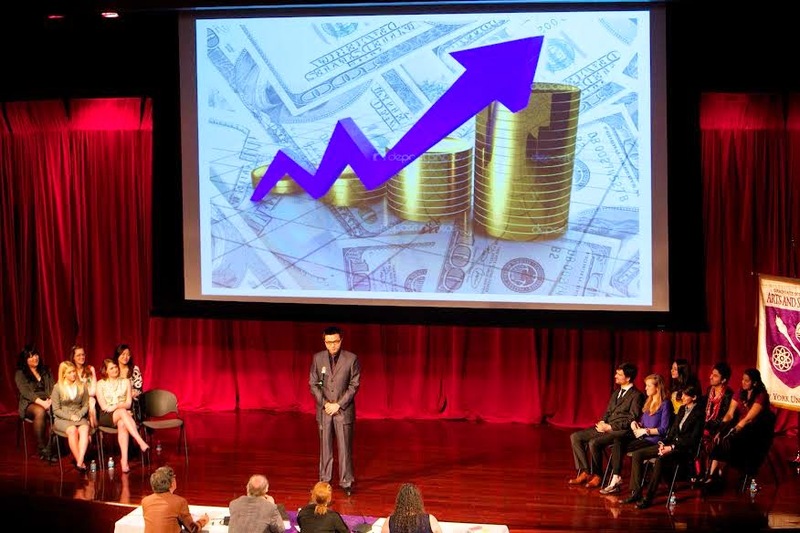 On Saturday, April, 12, 2014 twelve GSAS master's students competed in the 2014 GSAS Threesis Academic Challenge. 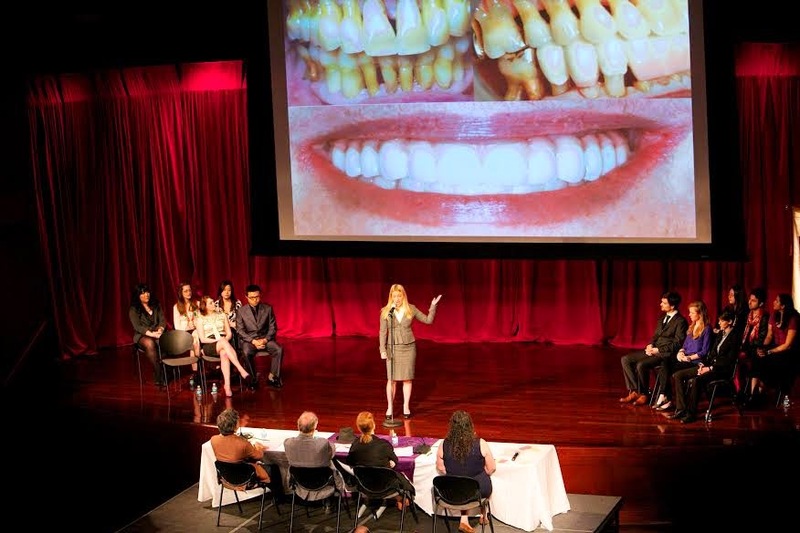 The Threesis Challenge is an academic competition for GSAS master's students. Students present the work of their thesis or final project (eg. creative project, science experiment or research paper) to a panel of judges in accessible language a non-expert can understand in three minutes or less. Competitors are judged on how well they grasp the subject of their thesis, their ability to discuss the topic to non-experts and presentation skills. Students compete for a grand prize of $1,000 and other prizes while learning to organize ideas and speak about them persuasively in a fun, academic atmosphere. This competition is adopted from the Three Minute Thesis Challenge currently taking place in Australia and New Zealand. Over the next week we will feature the winners of this year's competition as well as a few of the finalists. First up is First Place & Audience Choice winner Sarah Harris (GSAS '14). 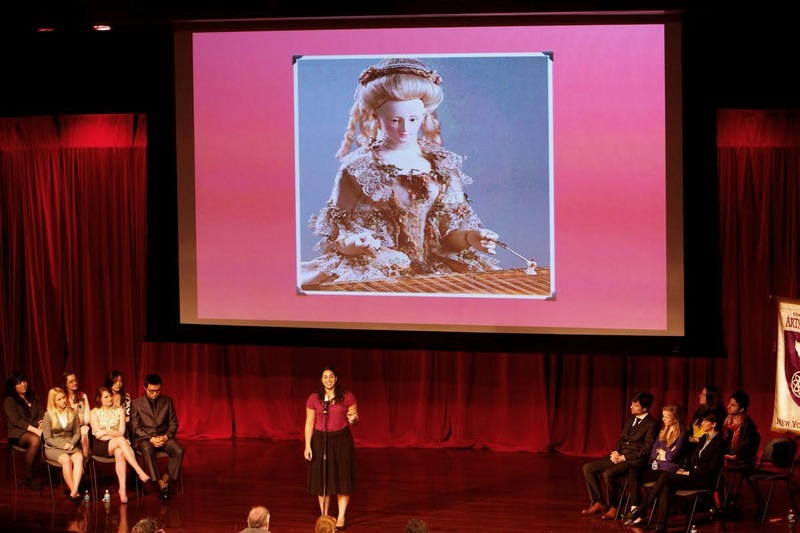 We asked Sarah three questions about her Threesis experience. My thesis looks at changing perceptions of human-machine relationships in Romanticism (1800-1840ish) through the literature of E.T.A. Hoffmann (Germany) and Mary Shelley (UK). A lot of important historical and technological changes were going on at this time - Enlightenment (the period before Romanticism) had fallen in love with machines and used them as a model to understand the world, and Romanticism leads in to the Industrial Revolution where machines begin to really impact people’s lives. The automaton, a self-moving machine built to look human, was a figure that was somewhere between human and machine, and these authors used it to comment on the changing landscape of human-machine relations. ...And His Work At BuzzFeed. 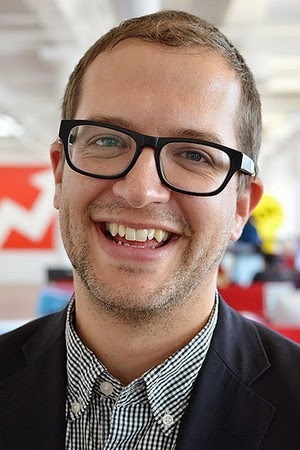 Scott Lamb (GSAS '04) is currently BuzzFeed's VP of international, "which is a needlessly oblique way of saying I'm in charge of opening international offices for the site." Aside from spreading BuzzFeed all over the world, he's also helped launch Disaster Girl, was a Fulbright recipient in Berlin, and Gizmodo called him one of the 25 most viral people on the internet. 1. What's your role at Buzzfeed and what projects are you currently working on? I'm currently the VP of international for BuzzFeed, which is a needlessly oblique way of saying I'm in charge of opening international offices for the site. We opened in London last year, in Sydney in January, and I'm currently working on setting up a team and an office in Berlin. I travel a lot trying to understand media markets around the world, and giving talks on what BuzzFeed is and how we do what we do.